Whether to divorce those who provide the physical network infrastructure from those that supply the services that run on it. This is the thorny question hidden in the bouquet of platitudes that is the Broadband – Platform for Progress report to the UN’s Broadband Commission, presented today (6 June 2011). 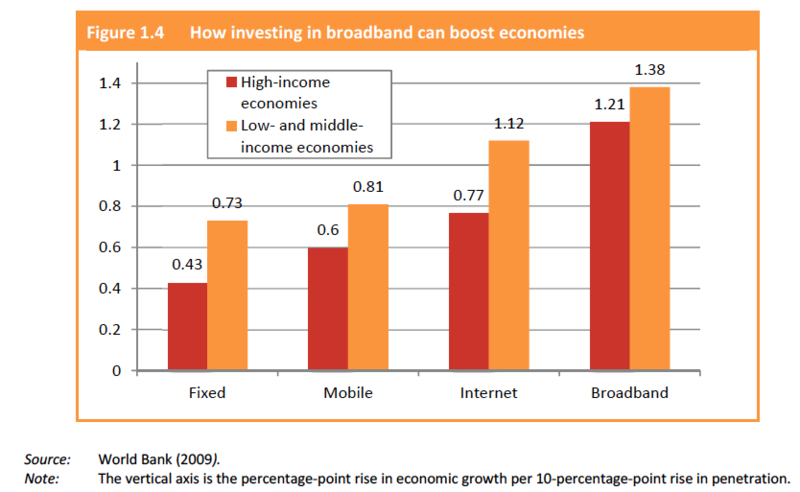 The report encourages governments, politicians and policy advisors to invest in broadband networks because they create jobs and grow the economy directly and indirectly. Given the deeply vested interests and controversial positions on the severance of network provision from service provision, the authors are probably right to hide this thorn among some attractive blooms. But they do put it there to be grasped. In a UK context, this is a clear call to split Openreach, which supplies and operates BT’s physical network, from the rest of the company, which sells services that use the network. But it is also recognition that in most countries there is little or no competition to the former (or present) state-owned monopoly network operator, particularly when the incumbent controls access to its infrastructure. The commission’s report shows clearly that privatisation and breaking up the former fixed network monopolies, mainly in developed countries 30 years ago, have led to lower consumer prices but patchy delivery of new technologies such as broadband. Network operators did little to expand coverage, preferring to sweat their existing assets. 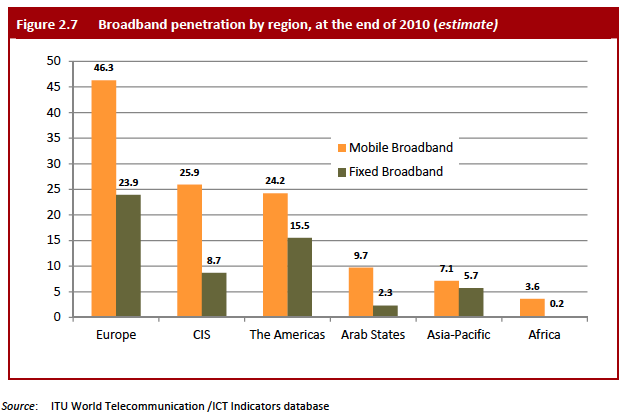 As a result, mobile broadband users in Europe outnumber those with fixed wire service by two to one. In Africa, the continent served most poorly by fixed network operators, the ratio is 18:1. The authors present much evidence, mainly from economists, that shows that, as with telephones, there is a direct correlation between broadband penetration and GDP growth. They argue for making access to broadband a universal obligation on network operators, but stop short of advocating Finland’s position where access to a 1Mbps broadband connection is a legal right. The problem for developed countries is that having privatised their telcos, they cannot now force them to ignore economic and financial reality, and insist they rebuild their existing networks to deliver “always on, high capacity” broadband to every citizen. Developing countries may in fact have more sway over their telcos, most of which retain close relationships with the government. In any event, the direct cost of converting existing or building fully digital networks fit for always on, high capacity broadband, (the report’s standard) is going to be high. Harald Gruber, the man who evaluates broadband project proposals for the European Investment Bank, says meeting the European Digital Agenda targets of universal broadband access by 2013 and then 30Mbps for all and 100Mbps for half by 2020, will cost between €72bn and €200bn. According to Gruber, the bank’s “back of the envelope calculation” suggests that markets can deliver about one-third of the money at normal commercial rates. Delivering the rest will require government intervention, he says. Fortunately for Europe, the European Commission is exploring ways to harness national budgets and other Euro budgets, and to make infrastructure investment more attractive to private sector investors. It remains to be seen how many member states will grasp the thorn they have been presented. If they do, private investment may suddenly become easier to find. David Brunnen, one of the authors of the report, assesses the relevance of the report for UK policy makers, telcos and funders here. Stitch up in West Sussex broadband? It felt like a stitch-up, the West Sussex Broadband Summit in Chichester last Friday. BT, represented by its MD for next generation access, Bill Murphy, was the only communications provider (CP) on the podium, and he was allowed free reign to sell BT’s fibre to the cabinet (FTTC) product to the delegates, mostly parish and local government representatives, plus some civil society bods from organisations like the Country Landowners Assocation. To be fair, Cable & Wireless’s Ian Fowler with Bill Lewis of Kijoma Broadband, a high speed mesh radio network operator were there to hold up the BT steamroller. But I suspect it was in vain. This matters. West Sussex is 50 miles from London, but it has three of the four BT exchanges in the county that have not been converted to xDSL. So some of its citizens can’t get any type of fixed broadband. Speaker after speaker from the floor castigated BT for the rubbish service they and their fellow citizens receive. One was getting 28kbps download. Tops. West Sussex is largely rural. It is also bisected by the South Downs National Park, which means the county’s natural high sites for radio are almost out of the question due to planning restrictions. Defra’s plans to have all farmers submit their paperwork online just won’t work here. But in case this comes across as just another rant against BT, let me hasten to add that Mike Hicks, the project manager for WSCCs bid for some of BDUK’s £530m budget, says no other CPs seem interested in his problems. He says he phoned Fujitsu Telecom following its dramatic offer to spend billions on network build, provided it has cheap(er) access to BT’s passive infrastructure and what’s left of BDUK’s money. After a run around to find the right person to talk to, he was asked how many people live in the towns? Clearly, they are looking to do hub and spoke networks from urban centres, says Hicks. “That’s not our idea of rural broadband,” he says. If you want to watch the whole show go here. But for those with less patience, try my 3.37 min video interview with WSCC leader Louise Goldsmith and Hicks. Nick Herbert, who hosted the event and promised us an interview, blew us off. Well, it had been a long day, it was Friday and there was culture secretary Jeremy Hunt to shmooze with. Communications providers (CPs) could face fines up to £2m for breaching new information gathering powers that Ofcom will gain when the European Electronic Communitions Framework is transposed into British law on 25 May. Ofcom to gather information related to “evaluating future network or service developments that could have an impact on wholesale services made available to competitors”. Ofcom to allow spectrum leasing and gather transmitter location information to ensure efficient use of spectrum. Ofcom said it was working to have discussion papers on these and other issues before the 25 May deadline.